The USS LOUISVILLE (SSN 724) is the fourth United States ship to bear the name in honor of the city of Louisville, Kentucky. Commissioned on 16 January 1862, the first LOUISVILLE, an ironclad centerwheel steamer served continuously with the War Department flotilla on the Western rivers. She participated in the successful siege that forced the surrender of Vicksburg on 4 July 1863. The second LOUISVILLE was originally the American Line steamship, ST. LOUIS. On 26 April 1918, the ship was renamed LOUISVILLE and served as a troop transport for several round trip voyages to Europe. The third LOUISVILLE (CA28) was launched 1 September 1930 at the Puget Sound Navy Yard, Bremerton, Washington and commissioned 15 January 1931. During World War II, she participated in several great naval campaigns in the Pacific theater. At the battle of Leyte Gulf, her most significant engagement, LOUISVILLE’S participation contributed to the virtual destruction of the Japanese naval forces. On 5 and 6 January 1945, two kamikazes scored direct hits on LOUISVILLE resulting in extensive damage. She was repaired and returned to sea only to be struck by another kamikaze on 5 June 1945. LOUISVILLE was awarded 13 battle stars for her service during World War II. The fourth LOUISVILLE (SSN 724) was commissioned on November 8, 1986 at the naval Submarine Base, New London, Connecticut. The 35th nuclear powered fast attack submarine of the LOS ANGELES (SSN 688) class design, USS LOUISVILLE is one of the most advanced attack submarines in the world. LOUISVILLE’S mission is to seek out and destroy enemy ships and submarines, and to protect our naval interests. At 360 ft and 6,900 tons, she is well equipped to accomplish this task. Faster than her predecessors and equipped with highly accurate sensors and weapons systems, LOUISVILLE is armed with sophisticated MK48 torpedoes and Tomahawk cruise missiles which can be vertically launched from any of the four torpedo or twelve vertical missile tubes located in the bow. During Operation Desert Shield/Desert Storm, USS LOUISVILLE (SSN 724) made naval history by firing the first submarine launched Tomahawk cruise missile in war. To accomplish this, LOUISVILLE conducted a 14,000 mile submerged, high speed transit across the Pacific and Indian Oceans to the Red Sea; firing shortly after noon on 19 January 1991. For exceptionally meritorious service from 17 January 1991 to 28 February 1991 during Operation Desert Storm, LOUISVILLE was awarded the Navy Unit Commendation. 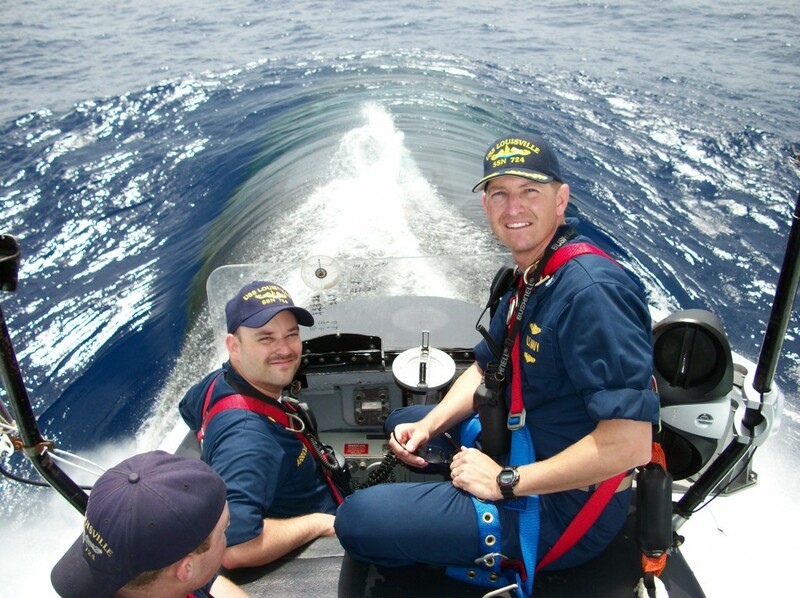 LOUISVILLE’S excellence was further noted when she was awarded the COMSUBRON Eleven Battle Efficiency “E” for 1992, and both the Meritorious Unit Commendation and the Joint Meritorious Unit Award for operations in support of the Kitty Hawk Battle Group during LOUISVILLE’S third major deployment to the Western Pacific, Indian Ocean and Arabian Gulf. LOUISVILLE then shifted homeports to Pearl Harbor for an extensive Depot Modernization Period, and has operated out of Pearl Harbor since 1996. LOUISVILLE returned to combat operations during Operation Iraqi Freedom. Near the end of a six-month deployment that had included very successful classified operations, LOUISVILLE was ordered at high speed to the Red Sea to prepare for Tomahawk strikes. Making history as the only Pacific Fleet SSN to have twice launched cruise missiles in combat, LOUISVILLE fired numerous salvos into Iraq in support of our forces. LOUISVILLE earned another Meritorious Unit Commendation and the 2003 COMSUBRON THREE Battle “E” for overall excellence. Louisville then entered a highly successful seven-month dry-docking that included an extensive modernization to fire control and communication systems, again making LOUISVILLE one of the most modern and capable submarines in the Pacific fleet. Upon completion of this modernization, LOUISVILLE conducted numerous Battle Group certification exercises and then another highly successful Western Pacific deployment in 2005 for which she was awarded her third Meritorious Unit Commendation. USS LOUISVILLE was tasked to return to the Western Pacific after only five months for a surge deployment.